When I was a child my grandmother would cook beef on a grill, over the chimney ashes, still glimmering. With chopped shallots on top. It was juicy and tasty, slightly smoky, unforgettable. To this day, beef prepared to such perfection remains a Grail like quest to me. Until Wagyu. Wagyu changed everything. You probably have seen it on gourmet menus. It’s often called the caviar of beef. It makes you wonder – is the price worth it? Oh, yes. Exquisite simply is an understatement. The way it simply melts in your mouth… Divine, probably is the closest description I can give you. 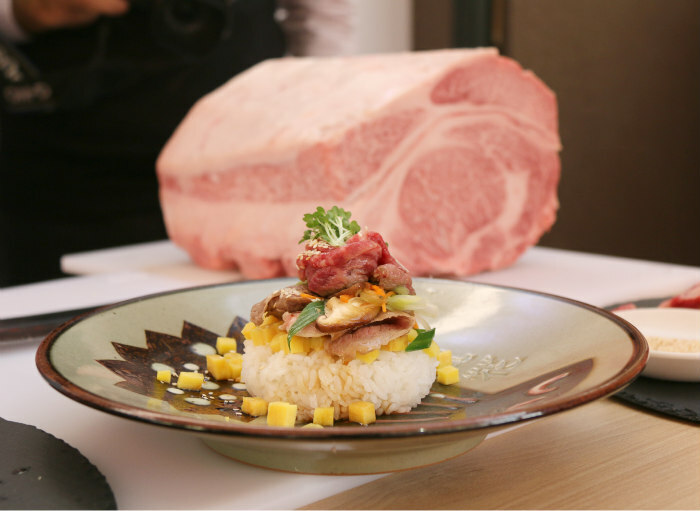 Let’s track back – I stopped at the Japan Livestock Products Export Promotion Council stand at the BBC Good Food Show (H60) to learn more about this delicacy. 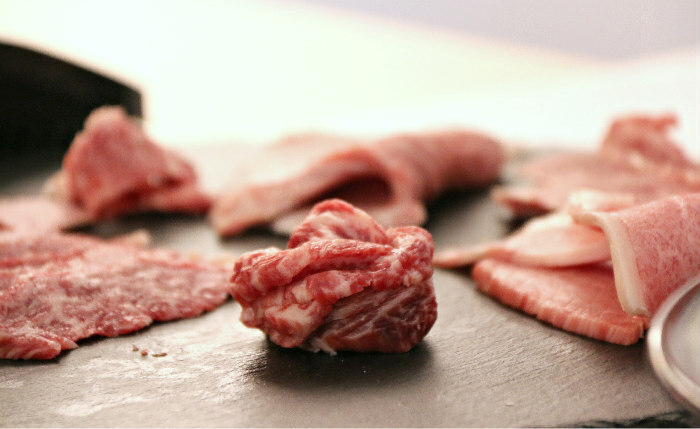 What is Wagyu? 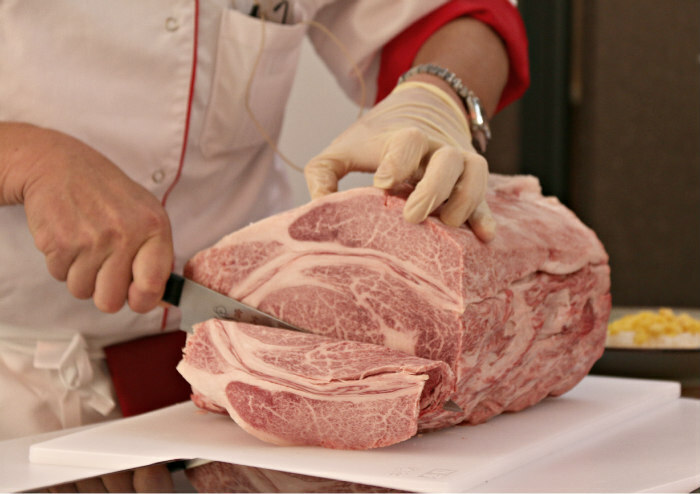 An extraordinary breed of Japanese beef (Wa means Japanese, Gyu, cattle), which meat is naturally marbled with fat. Oleic, omega 3-like fat, giving it incredible flavour and tenderness. It tastes… both refined, slightly nutty. It melts in the mouth instantly – the fat itself is umami, and so intensely satisfying. 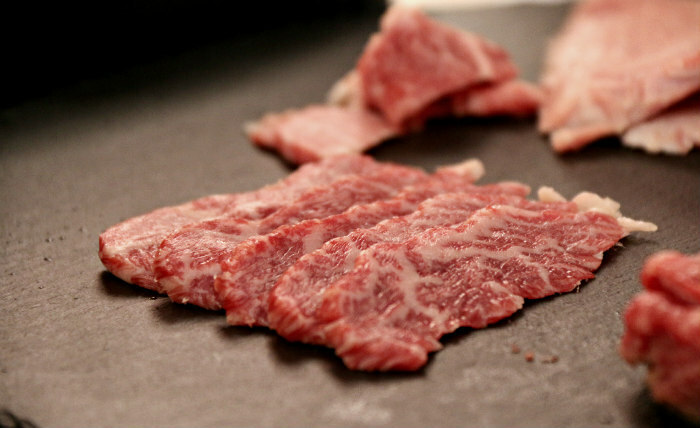 Not all Japanese beef is wagyu, though, only 40%. Japanese? But I have seen mentions of Australian, American, even British wagyu on menus? It is indeed bred elsewhere. But if you want the purest quality… go for the Japanese one. As soon as the calf is born, it is given a certificate and number that will track everything about it: information about its parents, grandparents, great grandparents. Where it comes from. Where it has been along its life. Even its nose print, the equivalent to our fingerprints! 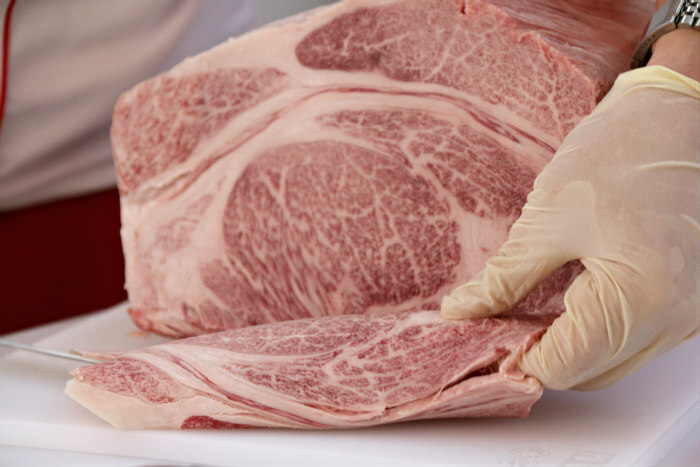 You can ask for that tracking number any time you buy Japanese wagyu – whether in a restaurant or a butcher – connect to the website and see all the information. 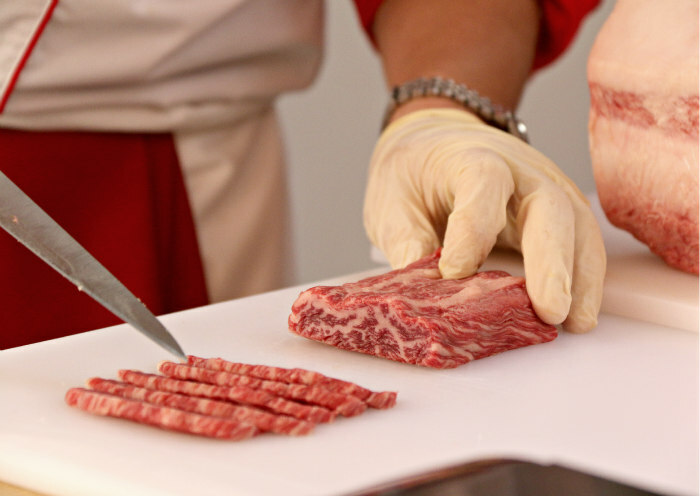 Further than that, Japan has a strict grading system when it come to the quality of the wagyu meat, the highest being A5. Everything matters – the colour, the marbling… But most importantly, to be called Wagyu, a calf must have a Wagyu mother and a Wagyu father. That is not necessarily the case everywhere else in the world… where a calf born from an Angus mother and a Wagyu father can indeed be called Wagyu still. It may be good… but it’s cheating a little. You do not get the full experience. How is it best eaten? Sashimi, carpaccio, gyudon, stew, curry, shigureni, gyudon, nikuyaga… You name it. Mostly, you want paper thin slices of it – this way the fat, when melting, transfers its incredible taste to the other ingredients. 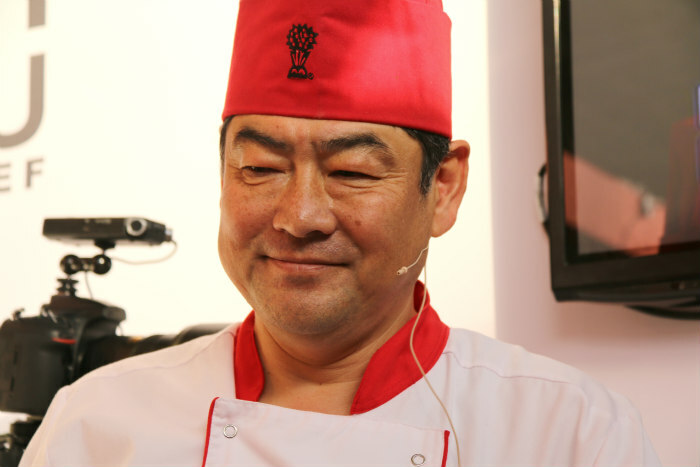 Toshio Suzuki, executive chef at Benihana, showed us the shabushabu method: slices immersed briefly in water boiling at 70 degrees. Taking the meat off the heat, he then added some sauce and vegetables to the pan, and oh my was the result gorgeous. We also tried two kind of croquettes: one was the basic recipe, the other was made with wagyu fat. The difference was clear. The basic recipe simply felt… bland. So, yes, it is expensive but there is so much to do with just a little piece of the cut. Where can I taste it in London? Benihana definitely would be my first stop as the chefs there will cut the meat and will cook it in front of you so you learn from it in the process. 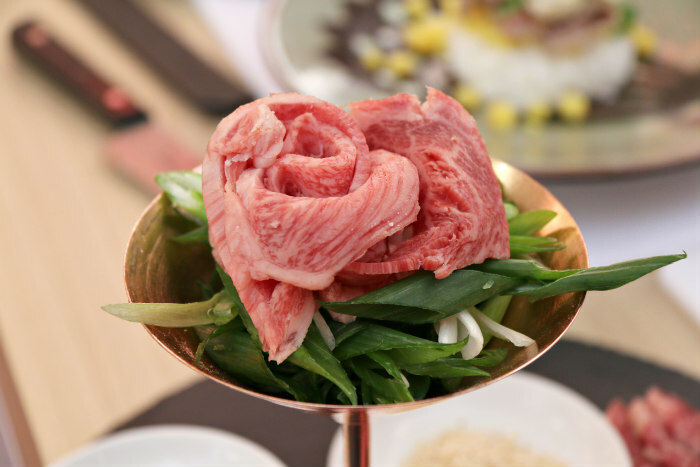 Alternatively, try Tokimeite, Tokyo Sukiyaki-Tei and Harrods. And if I just want to buy the meat and cook it myself? Then try Fortnum & Mason, Harrods, the Japan Centre, Atari-Ya, T.K.Trading, Wing Yip Cricklewood, Hampstead Butcher. Happy cooking!